I got this sample packet of Samurai Mate as part of a promotion that Adagio Teas was putting on when Teavana Teas was closing. 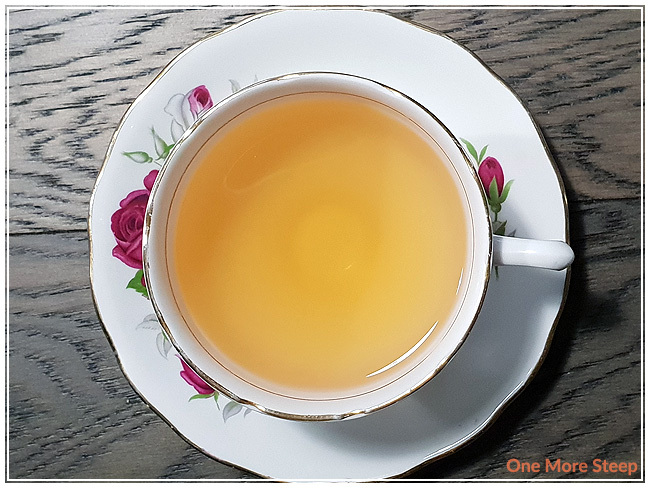 The packaging and label is nice and simple – very on point with their branding, and the label tells me everything that I need to know about the tea – steeping instructions and ingredients. Bonus points for being resealable, Adagio Teas! Something I greatly appreciate. Resealable packaging helps keep the tea fresh and ready to go for the next time I want to make a cup. If you’ve ever heard of Adagio Teas, it might have been their fandom teas (of which they have many…). Samurai Mate has a strong almond aroma, which the cardamom, ginger, and orange in the background. There’s fruit in the blend as well, and lemongrass, that I can see, but I can’t pick out those aromas. 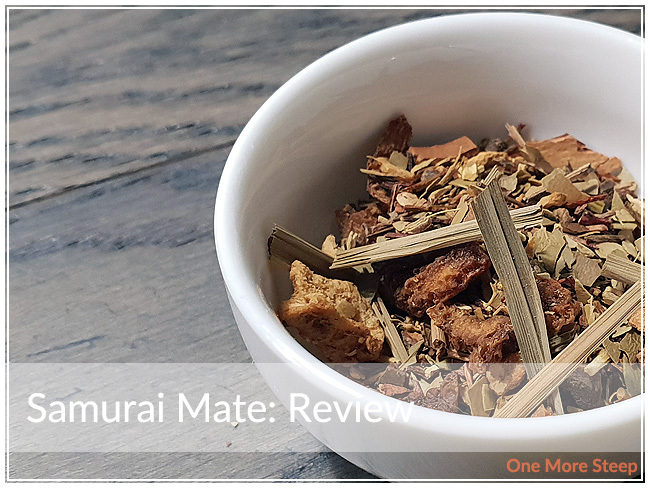 Samurai Mate consists of: yerba mate, green rooibos, cinnamon bark, ginger root, cardamom, orange peels, lemon grass, aniseed, almond flavour, spicy cinnamon flavour, mango pieces, papaya flavour and pineapple pieces. Adagio Teas recommends steeping Samurai Mate in 212°F (100°C) water for 5-10 minutes. My initial steep was for 7 minutes. Samurai Mate steeps to a beautiful golden orange colour. There’s a rich ginger and cinnamon aroma from the steeped tea, which I do taste as well. Along with the ginger and cinnamon, I taste the cardamom with a light sweetness – which may be from the fruit. I can’t taste the almond, which is unfortunate since it was so present with the dry leaf. The tail end of each sip has just a hint of bright citrus notes, which makes for a tasty cup. I attempted to resteep Samurai Mate, steeping for a total of 10 minutes. I found the colour and the flavour to be quite dilute compared to the initial steep. I didn’t really enjoy the resteep of the same leaves. 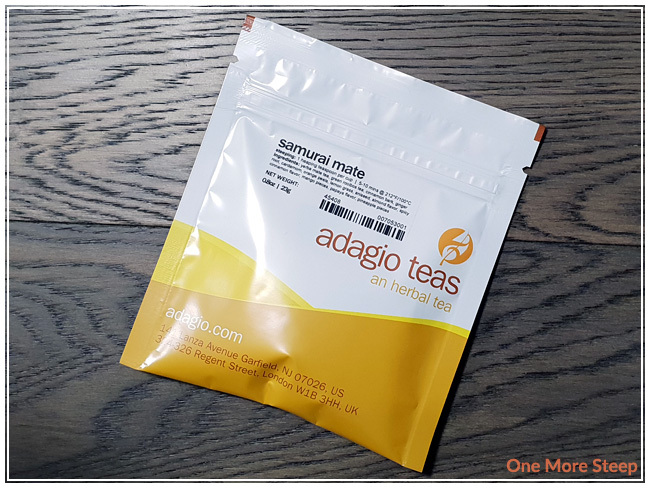 I liked Adagio Teas’ Samurai Mate. 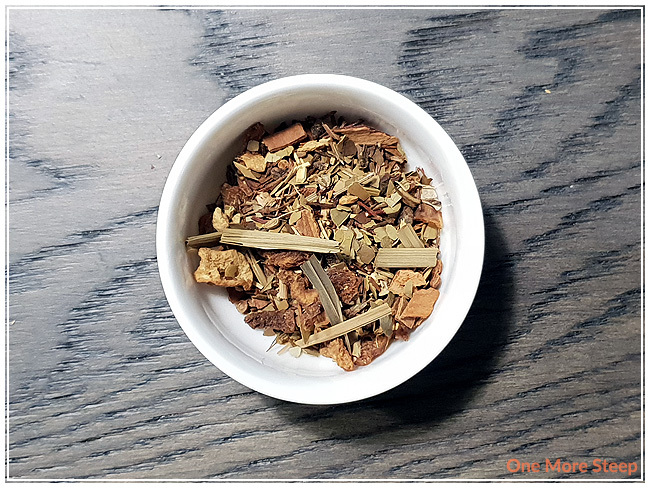 I really enjoyed the warming flavours of the ginger, cardamom, and cinnamon in the blend. The sweetness from the fruits was a nice touch, but I was a bit disappointed that I wasn’t able to taste the almond in the steeped tea. That said, I’m really grateful that I couldn’t taste the rooibos in the base as I’m normally not a very big fan of rooibos. 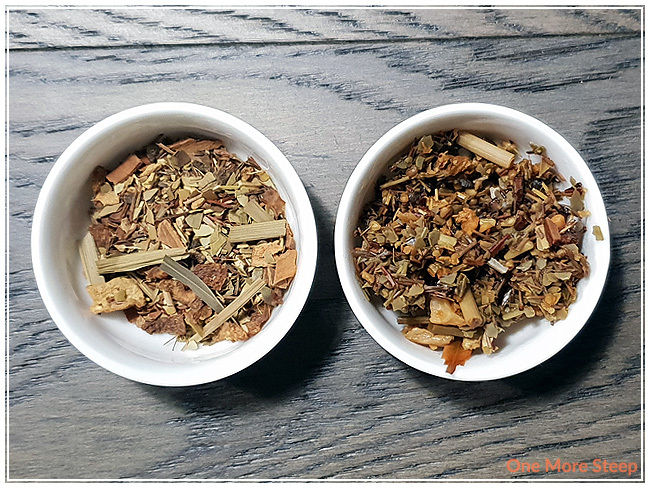 The citrus just added a touch of brightness to this blend, which made it quite delicious! I just wish that it had resteeped better since it was so enjoyable for the initial steep.